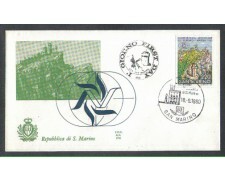 1980 SAN MARINO - Europa Uomini illustri (Cat. Unif/Sassone N° 1054/1055 - Yvert. N°1011/1012) Serie completa di 2 valori Nuovi gomma integra in quartine. 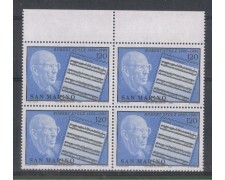 1980 San Marino - Europe Illustrious Men - Complete Series 2 new values ​​MNH - Block of four. 1980 - LOTTO/8006Q - SAN MARINO - LONDON 80 QUARTINA NUOVI. 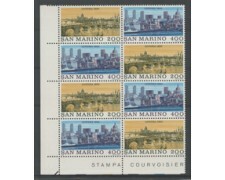 1980 SAN MARINO - Esposizione Filatelica London 80 (Cat. Unif/Sassone N° 1056/1057 -- Yvert. N°1009/1010) Serie completa di 2 valori uniti in quartine nuovi gomma integra. 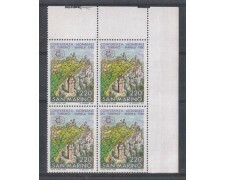 1980 San Marino - 80 London Stamp Exhibition-new complete set of 2 stamps MNH. 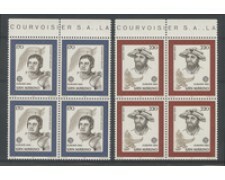 Block of four. 1980 SAN MARINO - Natale dipinti di Andrea del Sarto (Cat. Unif/Sassone N° 1066/68 - Yvert. N° 1021/1023) serie completa di 3 valori Nuovi gomma integra in quartine. 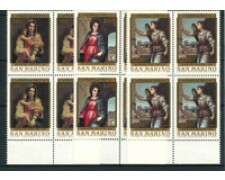 1980 San Marino - Christmas paintings by Andrea del Sarto - Complete Series 3 new stamps MNH. Blocks of four. 1980 - SAN MARINO - NATALE DIPINTI DI ANDREA DEL SARTO (UNIF.SASS.1066/1068 - Yvert. 1021/1023) SERIE COMPLETA 3v. NUOVI GOMMA INTEGRA ORIGINALE. 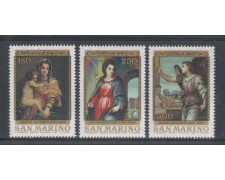 1980 San Marino - Christmas paintings by Andrea del Sarto - Complete Series 3 new stamps MNH. 1980 - SAN MARINO - CONFERENZA MONDIALE SUL TURISMO (UNIF/SASS.1065) FDC (FILAGRANO). 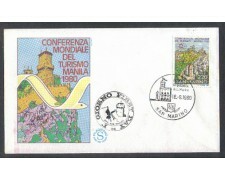 1980 - SAN MARINO - CONFERENZA MONDIALE SUL TURISMO (UNIF/SASS.1065) FDC (ALA). 1980 - SAN MARINO - CONFERENZA MONDIALE SUL TURISMO (UNIF/SASS.1065) NUOVO GOMMA INTEGRA ORIGINALE. 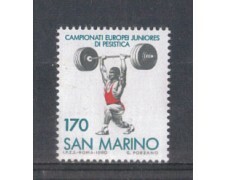 1980 - SAN MARINO - CAMPIONATI EUROPEI JUNIORES DI SOLLEVAMENTO PESI (UNIF/SASS.1064) FDC (FILAGRANO). 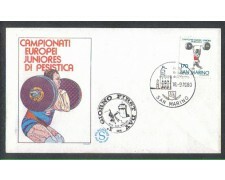 1980 - SAN MARINO - CAMPIONATI EUROPEI JUNIORES DI SOLLEVAMENTO PESI (UNIF/SASS.1064) FDC (ALA). 1980 - SAN MARINO - CAMPIONATO EUROPEO JUNIORES DI SOLLEVAMENTO PESI (UNIF/SASS.1064 - YVERT.1020) francobollo uovo gomma integra in quartina. 1980 - SAN MARINO - CAMPIONATO EUROPEO JUNIORES DI SOLLEVAMENTO PESI (UNIF/SASS.1064) NUOVO GOMMA INTEGRA ORIGINALE. 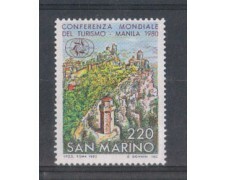 1980 - SAN MARINO - CENTENARIO DELLA NASCITA DI ROBERT STOLZ (UNIF/SASS. 1063) FDC (FILAGRANO). 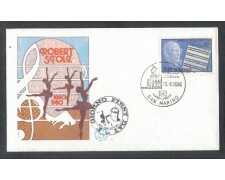 1980 - SAN MARINO - CENTENARIO DELLA NASCITA DEL MUSICISTA ROBERT STOLZ (UNIF/SASS.1063) FDC (ALA). 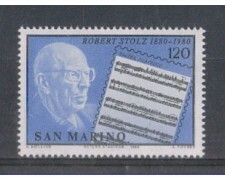 1980 - SAN MARINO - CENTENARIO DELLA NASCITA DEL MUSICISTA ROBERT STOLZ (UNIF/SASS.1063 - Yvert. 1018) francobollo Nuovo gomma integra in quartina. 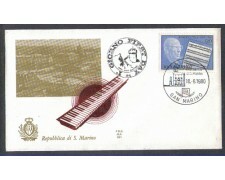 1980 - SAN MARINO - CENTENARIO DELLA NASCITA DEL MUSICISTA ROBERT STOLZ (UNIF/SASS.1063) NUOVO GOMMA INTEGRA ORIGINALE. 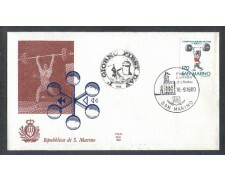 1980 - SAN MARINO - 22° GIOCHI OLIMPICI DI MOSCA (UNIF.SASS. 1058/062) 2 FDC (ALA). 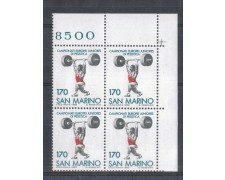 1980 - SAN MARINO - 22° GIOCHI OLIMPICI MOSCA (UNIF.SASS.1058/1062 - YVERT. 1013/1017) SERIE COMPLETA 5v. NUOVI GOMMA INTEGRA ORIGINALE. 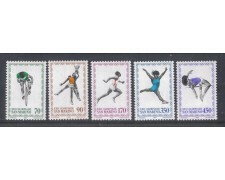 1980 San Marino - Moscow Olympics - New full set of 5 stamps - MNH. 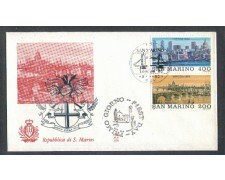 1980 - SAN MARINO - ESPOSIZIONE FILATELICA "LONDON 80" (UNIF.SASS.1056/57) FDC (FILAGRANO). 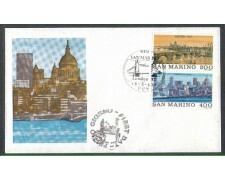 1980 - SAN MARINO - ESPOSIZIONE FILATELICA "LONDON 80" (UNIF/SASS.1056/057) FDC (ALA).